Last night we learned that Donald Trump instructed Michael Cohen to lie to Congress about Trump Tower Moscow, and that Special Counsel Robert Mueller has the evidence to nail Trump for it. This means two things. First, Mueller is obviously about to take his big swing at Trump in short order. Second, it means the House must, and will, begin the impeachment process accordingly. Adam Schiff has something to say about that. 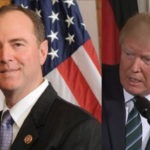 Congressman Adam Schiff, who is now in charge of the House Intelligence Committee, is in prime position to help expose Donald Trump’s Russia-related crimes. Even though the specific charge at hand here is suborning perjury, a form of felony obstruction of justice, the perjury was an attempt at covering up the Trump-Russia election conspiracy. We already knew that Schiff’s House Intel Committee was going to swiftly and aggressively investigate the Trump-Russia election conspiracy. But now it sounds like Schiff is talking about something much bigger. We’re likely now just weeks away from the start of the impeachment process against Donald Trump, unless he cuts a resignation plea deal first.